Pinwheels are offered to aborted and miscarried babies, deceased babies and infants as substitute for flowers. 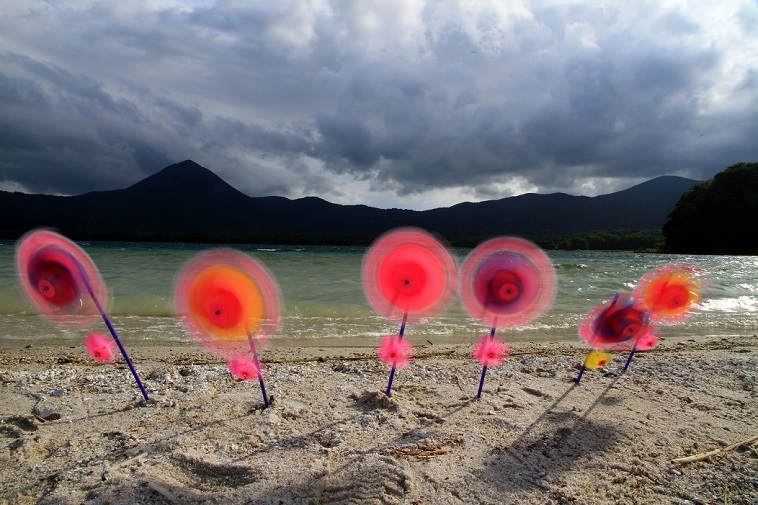 Some people say pinwheels symbolize a cycle of reincarnation. 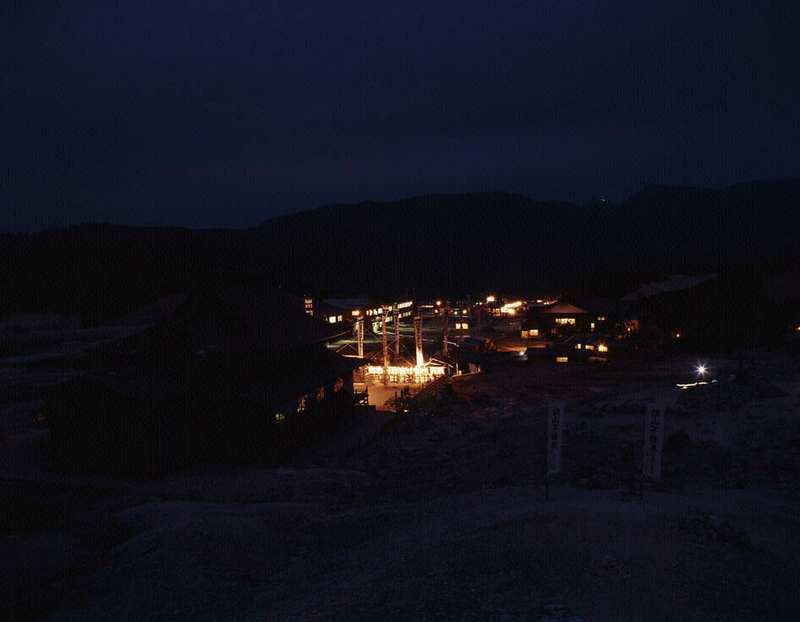 Osorezan(恐山, Mt. 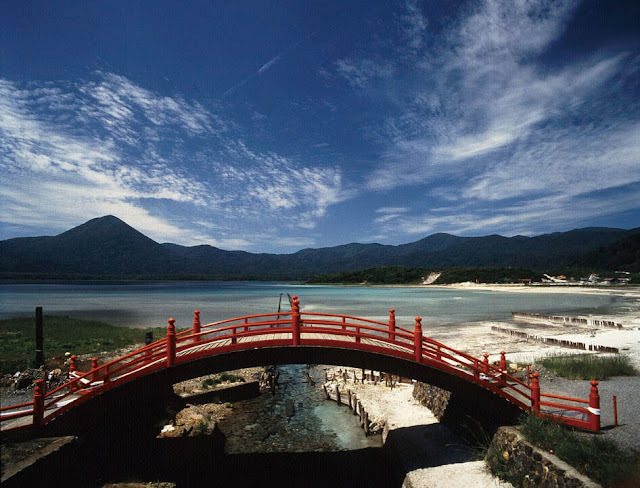 Osore), also known as Usoriyama, is a stratovolcano with a caldera lake(Lake Usori-ko) and hot springs located the centre of Shimokita Peninsula in Aomori Prefecture. 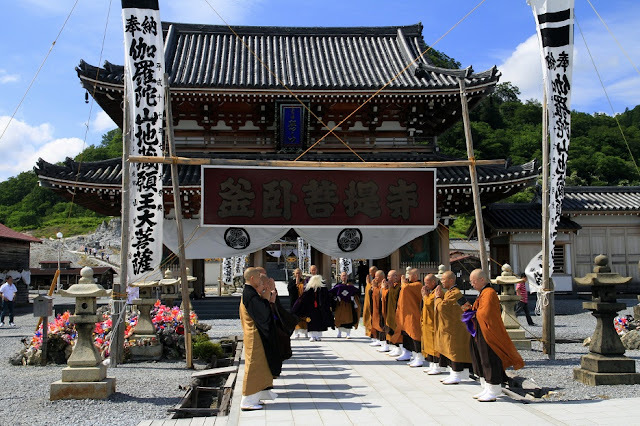 Osorezan Taisai Festival(Osorezan Grand Festival) was held at Osorezan-Bodaiji temple(恐山菩提寺) located in Osorezan from July 20 to 24. The temple hold annual festivals in July and October. 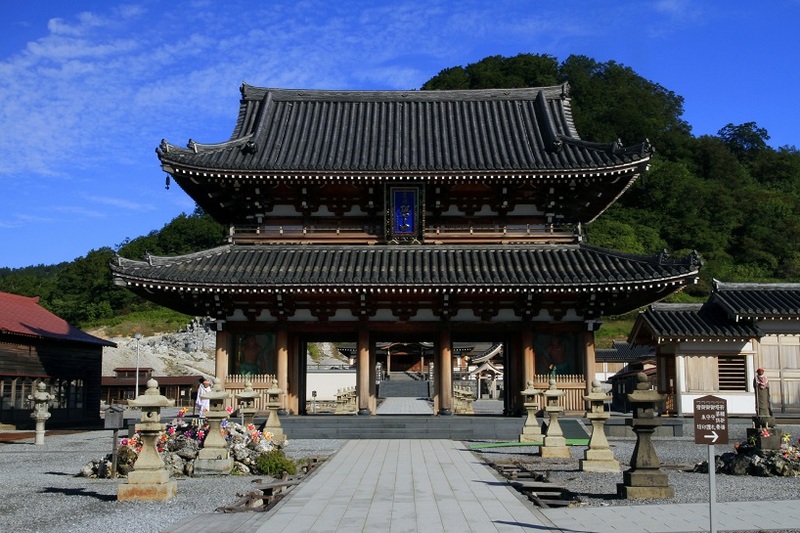 Tradition says buddhist monk Jikakutaishi established the temple in 862. 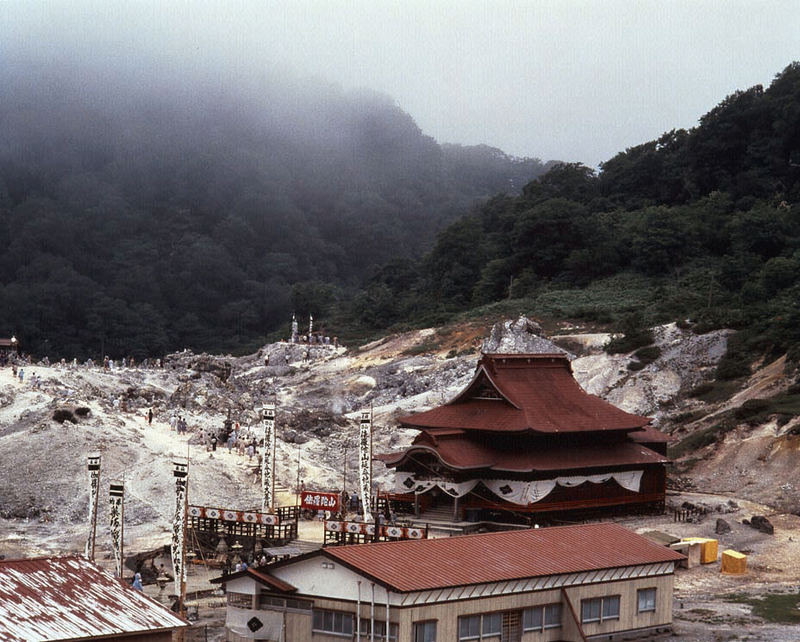 Osorezan has been considered as a sacred ground. 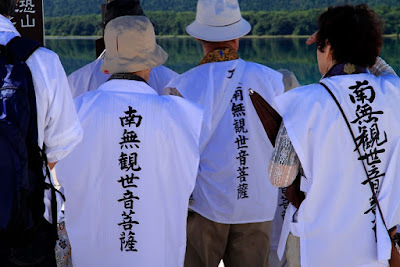 Through a ritual process known as "kuchiyose", blind mediums known as itako claim to communicate with the dead and deliver messages in their voices during annual festivals in July and October. Some poeple say they speak this region's dialect too fast and it's hard to catch words in it. 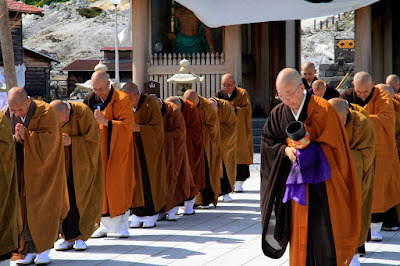 Kuchiyose in the temple started after the WW2. The temple has no part in it. 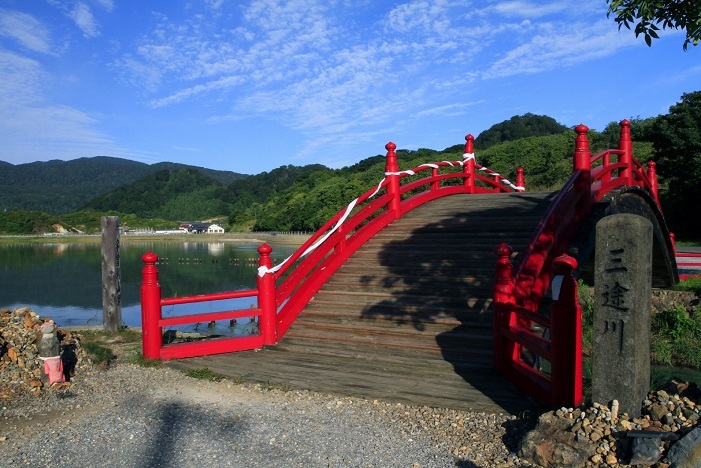 The bridge is the entrance to the hallowed ground, Osorezan. But the bridge is a little way off the temple. The Sanzu River(Sanzu-no-kawa), officially known as Shozu-gawa River(正津川), is similar to the Styx. 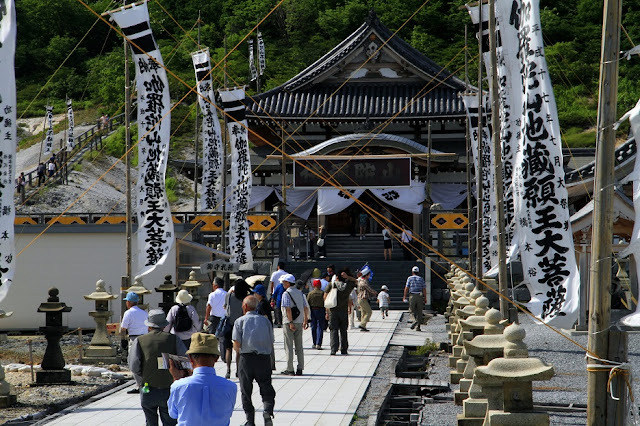 The bridge over the Sanzu River straddles the border between this world and the underworld. It is said the bad can't go over this bridge and visitors must not look back on the bridge on return route. 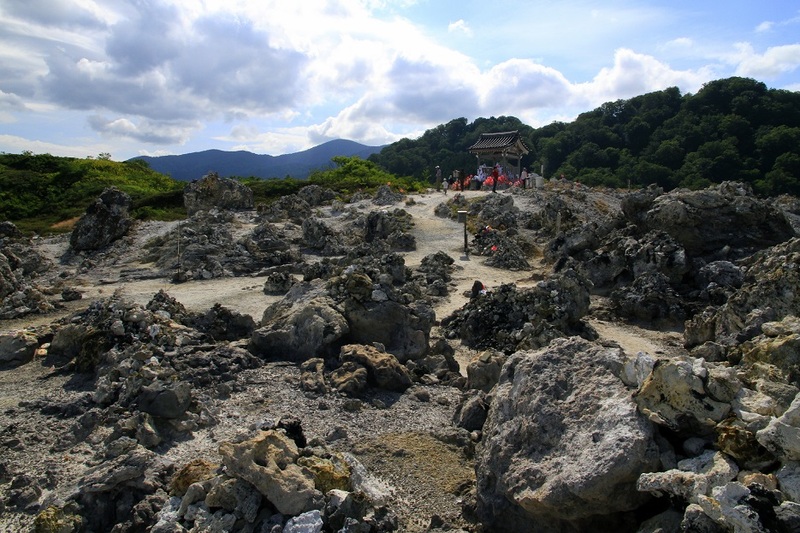 Osorezan is a sacred place, but it attracts a lot of tourists. 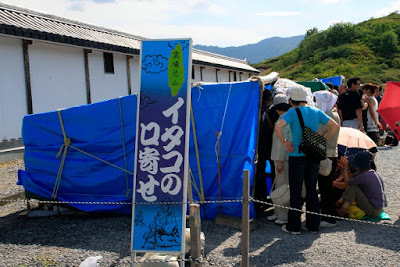 There are a restaurant and a souvenir shop near its front gate. Tourists can take a taxi and many tour buses stop there. Six Ksitigarbha statues stands near the front gate. The Ksitigarbhas protect all beings in the Six Realms(the human realm, the demi-god realm, the god realm, the animal realm, the hungry ghost realm, the hell realm) of Karmic Rebirth. 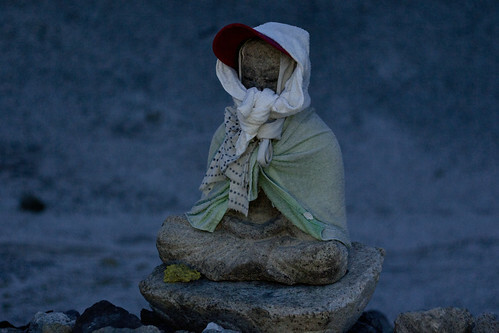 All living beings are born into one of the six states of existence among Buddhists. 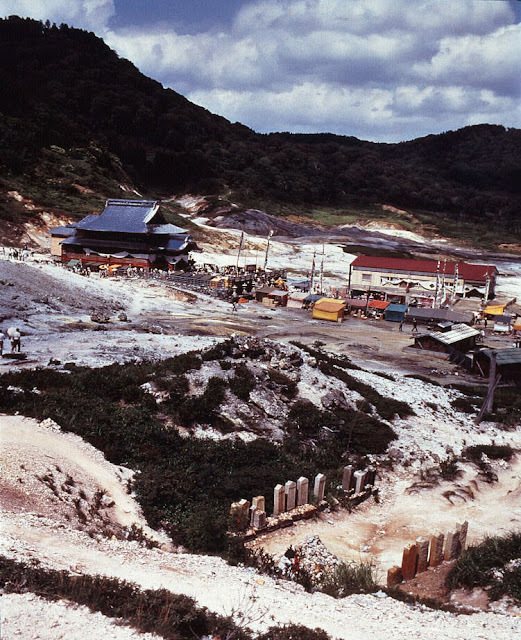 Four hot springs cabins are located on the ground. 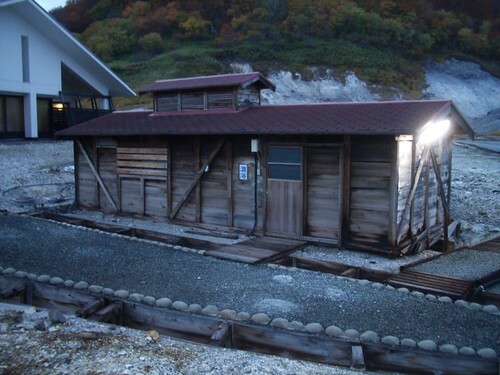 Visitors can take a bath in these hot springs, but the cabins are visible through a window. Worshippers used to purify themselves before offering prayers. Temple lodging is available. It's an air-conditioned accommodation. A night's lodging costs 12,000 yen(one night and two meals per day). In principle, lodgers have to attend the morning religious service. Sotobas with a height of three meters. 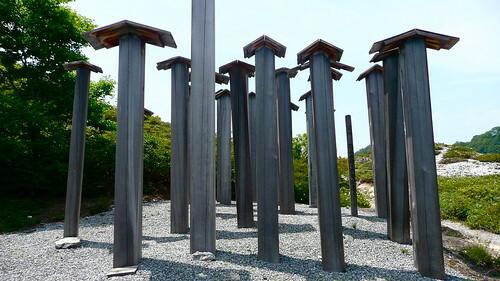 Sotoba(toba) is a tall wooden tablet to pray for the repose of souls. 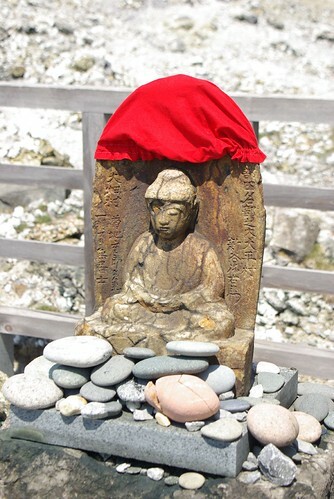 Sotoba derives from the Sanskrit word stupa. This hall was built to enshrine Enmei Jizo Bosatsu (literally, Apothanasia Ksitigarbha), the temple's principal image of Buddha. White cloth were tied by worshippers. 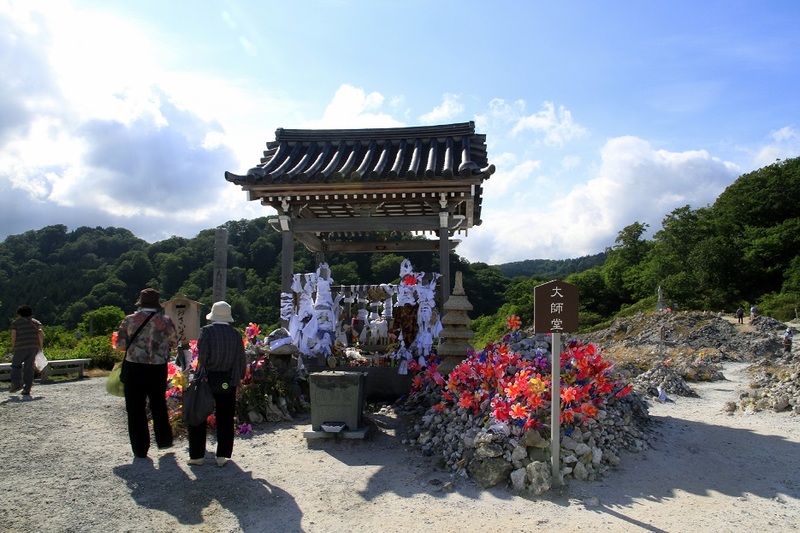 Stone piles were build by the bereaved to console the spirits of their deceased family members. An old woman called Datsueba plunders the clothes of the dead, and an old man called Ken-eo hangs the clothes on a riverside tree branch to measure the weight of guilt. They stay in the Sanzu River. 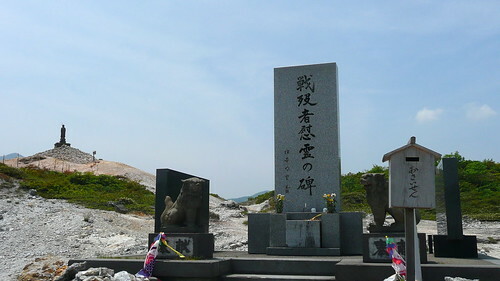 I just visited Osorezan last month. What a strangely beautiful place! Thank you for your comment! 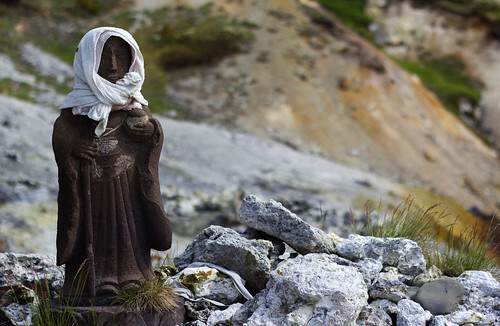 We think of Osorezan as an eerie and mysterious place, but it seems to abound in feelings for the dead persons.